Bell ringers will gather this Remembrance Day in their respective places of worship across the country and around the world to remember the sacrifice of those who served and died in WWI. This will take place at the going down of the sun which locally is 4:44 pm. Peace finally arrived at the 11th hour, of the 11th day of the 11th month - 100 years ago and the bells of remembrance will recognize the loss to both those who served and civilians. Canadian bells will be tolled 100 times, in a manner similar to a funeral with a 5 sec. period of silence between each tolling. 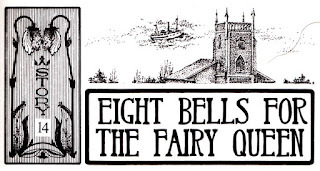 Some counties have chosen other times during the day to ring their bells, and in the UK bell ringers will both toll their bells, but change over half way through to full ringing (like wedding bells, to celebrate the long-awaited peace). The tradition of using bells as a way of communications is longstanding and many stories are told of how people in England first learned of peace 100 years ago through the ringing of the local church bell as news travelled across the countryside bell ringer to bell ringer in a time when alternate means of communication were limited but joyful bell ringing was a sign recognized by all, at work in fields or in villages. Charlottetown residents recall the end of WW II which likewise was communicated with the ringing of church bells. Allan C. McLeod, of Prince Charles Drive recalled the day as a boy well. 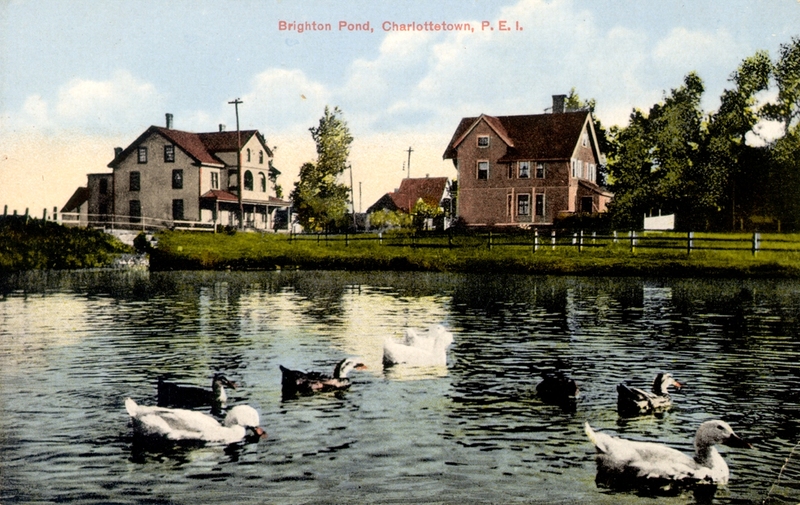 In 1945 he and a friend were at the Charlottetown Driving Park. The memory remains fresh, “I’ll never forget it, the bells ringing across the city and everyone looking around and wondered what it meant.” The arrival of peace was a moment in time that became a demarcation in the flow of events for families, communities and entire countries, as the dread of awaiting sad personal news from war zones would gradually pass away. For Allan McLeod the bells announcing the end of war permanently established a clear memory of where he was, and who he was with. Various local churches have been contacted by the Royal Canadian Legion and have agreed to participate in this historic event to mark the 100th anniversary of the Armistice of Nov. 11, 1918. Bells will commence at 4:44 pm, as an appropriate way to mark this occasion. Allan McLeod will be among the bell ringers at the Kirk of St. James on Sunday. While a designated heritage resource stands unused for many years now, the gas station known as Euston Street Irving served Charlottetown residents for many years as a local station at a time when there were often gas stations on many corners. It had been a survivor when many others closed but it was finally shuttered and remains in an unused state at the corner of Queen and Euston. 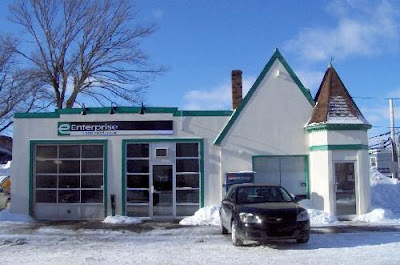 The heritage value of 85 Euston Street lies in its role as the only remaining gas station of its type on Prince Edward Island and its association with Acadian architect, Samuel Roy. 85 Euston Street is an example of a small turreted gas station designed by Samuel Roy. He designed a limited number of these particular little gas stations for founder of Irving Oil and fellow Bouctouche, New Brunswick resident, Kenneth Colin Irving, in the 1930s. A number of Maritime cities and communities had them including Halifax, Bridgewater, and Truro in Nova Scotia and Sackville, New Brunswick but few examples remain. It is likely that this gas station was constructed in the early 1930s. It remained a popular filling station until 2008 when it closed. A rental car business now operates from the building. 85 Euston Street is the only gas station building of its type left standing on Prince Edward Island. Traditionally, these stations were white with red trim, featured the Irving logo and contained two service bays, a gable roof and a distinctive corner tower. Influenced by the Queen Anne Revival or Chateauesque style, they were seen as a new type of station for a new kind of business. 85 Euston Street's structure has remained intact but the trim has been changed to green and the Irving logo is no longer visible. The pumps were removed in 2008. Acadian architect, Samuel Roy began designing filling stations for KC Irving in 1931 and continued to do so until 1974. Roy was born in Sainte-Marie-de-Kent, New Brunswick on 8 May 1895. He completed his primary education in Bouctouche, New Brunswick and then went on to Boston, Massachusetts where he began to study architecture. Roy joined the Canadian Armed Forces in 1918, but returned to his studies, eventually going on to work with the Irving Oil Company designing stations as well as the Irving manor. He died in 1978. Examples of similar stations include the Sackville NB station which was acquired by the Village Historique Acadien in 2005 and restored to it's initial condition. The station in Grand Pre, NS has had some sympathetic restoration and remains in operation. 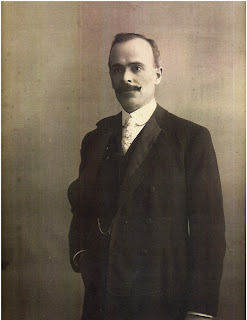 We share a family connection to Isaac Smith (my wife's great-great-great grandfather) and thus over the years various family items and the interest of descendants has been of assistance to others who are researching the work and life of an important Island architect. Included is a link to genealogical resources related to Smith through my family history website Homeport. Parks Canada undertook the research and writing of a history of Province House in 1977 through Island-born, staff historian Mary Cullen. Published as a report it is now available online in .pdf format. Server connections can be slow but patience produces the full 450 pages of this valuable research. It was great to see that Dr. Alan MacEachern and the team at ParksCanadaHistory.com created a site where older reports such as this are now widely available. The full title is: A history of the structure and use of Province House, Prince Edward Island, 1837-1977 / by Mary K. Cullen. 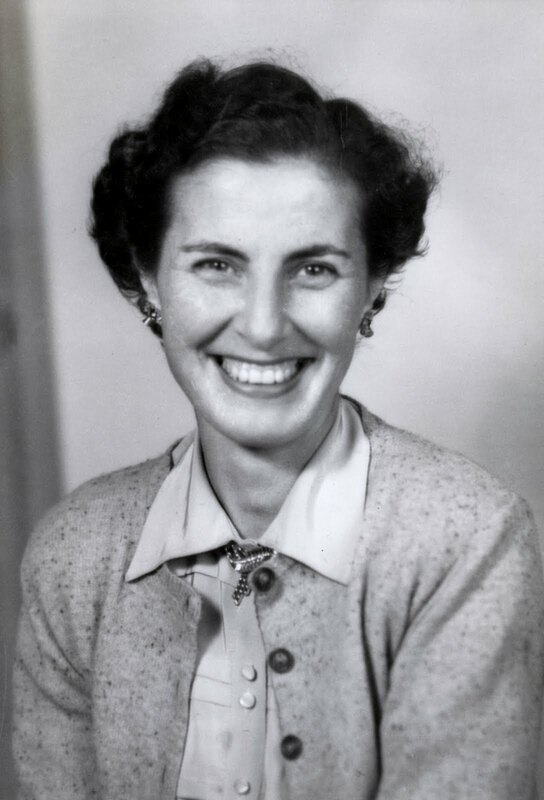 Daphne's aunt, Marianne (Rogers) Morrow researched Isaac Smith in the 1970's and 1980's. Marianne's research produced the excellent magazine article published in the Island Magazine. It is entitled: The Builder: Isaac Smith and Early Island Architecture, The Island Magazine, No. 18, Fall/Winter 1985: 17-23. The digital form of the article is available thanks to the Robertson Library at UPEI. Marianne and her siblings decided to donate Isaac Smith's day books and other original documents in family hands to the PEI Public Archives and Records Office where they formed part of the Smith, Alley Collection Acc2702, which includes over 1168 textual items, plus 235 images collected by Judge George Alley and Henry Smith pertaining largely to the early history of Prince Edward Island. 92-94 Hillsborough Street, Charlottetown is also included in their listing. In 2001 Maplewood Books, Charlottetown published Isaac Smith and the Building of Province House by C.W.J. Eliot as part of a series called Prince Edward Island Architects: A series from the Institute of Island Architectural Studies and Conservation. The eight page illustrated document is an excellent introduction to Smith and his work. Daphne and I have some original Isaac Smith items including, a previously unknown image of Isaac taken when he was younger (above). The image is damaged but still is recognizable and was an exciting discovery when it was located in 2009. 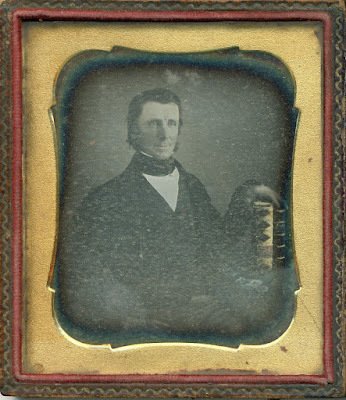 The original ambrotype (on glass) that all previously known images of him were derived from remains in its original case and the younger image is a daugerrotype (on a silver plate). 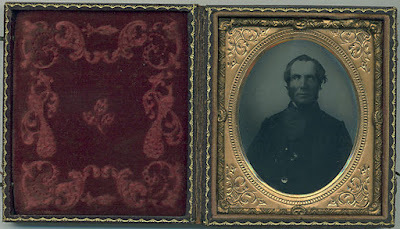 Also located in 2009 were originals of Isaac's brother and business partner Henry Smith and an unidentified image next to it with a similar case which we speculate to be Henry's bride Ann "Nancy" Bovyer. That branch of the family moved as an almost intact family unit in 1858 to Auckland, New Zealand on the Prince Edward, a ship built in Summerside for the voyage. That voyage and the emigration of Islanders to New Zealand is told in an article called, The Prince Edward Settlers, the passenger list is also available. 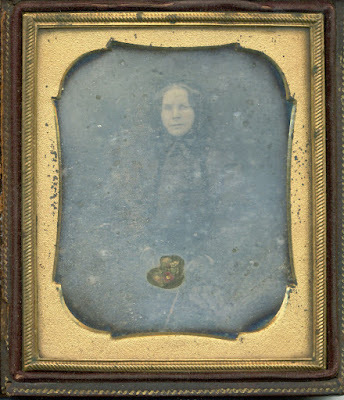 Daguerreotype original photographed by Ian Scott. 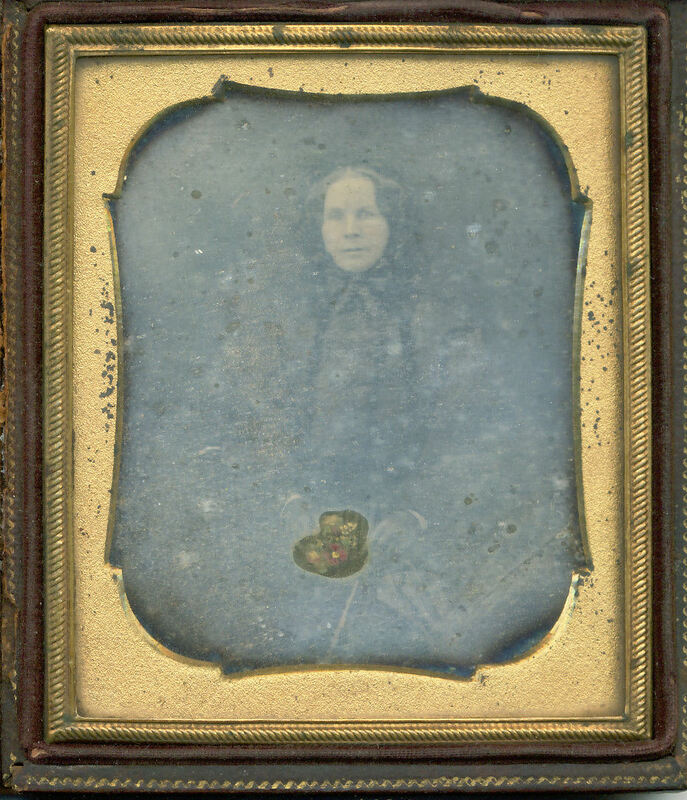 Presumed to be Ann "Nancy" (Bovyer) Smith (1802-1862). Found next to a matching image of her husband in 2009. The two Smith brothers and Nathan Wright (of the firm Smith Brothers & Wright) lived close to the job site when working on Province House as all three families lived on the Prince Street block across from St. Paul's Hall. Isaac in a wooden house on the Richmond corner (where the current brick, Houle House now stands) with brother Henry next door at 100 Prince St. in the blue wooden house, and Nathan Wright up the street at 112-114 Prince. As the architect for Government House as well as Province House, Isaac Smith's role is documented in the collection of known source records related to Government House and related visual material that was produced as a two volumes set available in pdf format. The books were digitially published in 2015. The two documents are an invaluable resource to current and future researchers as well as those making decisions about Fanningbank. 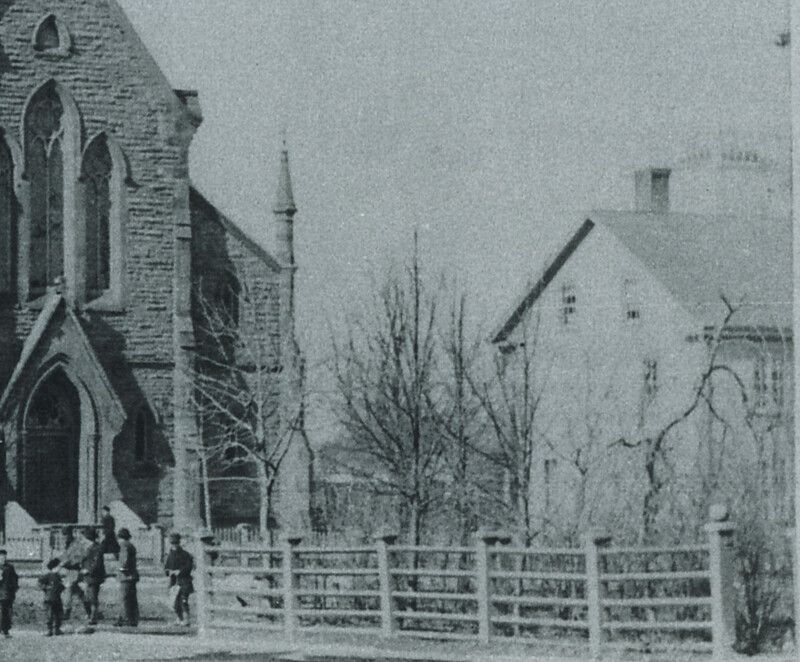 During renovations in May 2018, work on a house numbered 43 Churchill Ave. in Charlottetown revealed lines that helped verify a local tradition within the Kirk of St. James, a Presbyterian church with roots dating to 1825, that a portion of the original building was moved to a site on Churchill Ave. in the 1890's and converted into a private dwelling. While the moved structure had been documented as being located at 43 Churchill Ave. there was still a mystery about the location since the roof lines of the building did not match any pictures or paintings of the original church and it was difficult to know exactly how the conversion of a building that looked so different actually took place. Prior owners of the Churchill Ave. property were aware of a church connection when I toured the building in the 1990's thus we knew a verbal tradition separate from the church tradition had been maintained. When new owners removed the siding as part of their renovation efforts in 2018, the boards of the 'Auld Kirk' which had seen many years of service in three locations were visible along with their original square head nails. 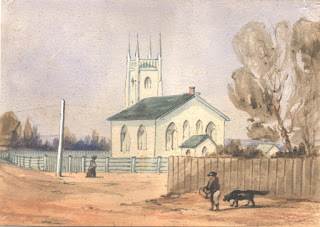 The structure is shown in an attached painting and photograph as being at the back of the church located on the Pownal Street side. The tower of the church faced the harbour. The boards reveal that a one-story structure at the Churchill Ave. site was extended upwards to create a two story structure with a steeper pitch for the roof line. The boards also showed that at a later date an addition was placed on the right side of the building to enlarge the house and give an entry hall and improved staircase to the second floor. The colour of the boards also suggest that the bay window was likely a later addition, a theory which is reinforced by the fact that it does not sit on the original house foundation. The old church building sat next to the original church site on Pownal St. for 20 years serving the congregation as a meeting space during the construction period and as a church hall until the new hall was added to the stone church in 1890's. It seems that the twice-moved structure left the Kirk site at the corner of Pownal and Fitzroy St. as a three sided structure with cross-bracing used to keep the open side stable during the move. It had been attached to the main church and thus would have lost the fourth wall when the building components were detached. Looking at the end fronting on Churchill Ave. today would suggest that this was the intact end thus was the exterior of the Kirk building and that the open (braced) side of the three sided structure was incorporated into the interior of the building. The location was starting to develop more housing in the 1890's. In the 1880 Meacham's Atlas, Churchill Ave. ended at a stream running into Government Pond; it was known then as Cross Street and ran from Spring Park Rd. but ended at the stream. The Kirk was also a contributor to other buildings in the general neighbourhood. The larger portion of the 'Auld Kirk' was also moved to find its third third home at 33 Euston Street; eventually that building was demolished in order to construct a triplex. An early Kirk manse was likewise moved onto Euston St. in 1906 where it sits as 5 Euston today despite some alterations to the facade. The Kirk of St. James along with a manse at right prior to 1906. The former Kirk of St. James manse at left after it was moved by J. J. MacKinnon to 5 Euston St.
and converted into a two-tenement residence.. The former Kirk of St. James manse now located at 5 Euston St. after conversion into an apartment building. The Kirk also contributed to another Brighton Road facade being the impressive brick mansard roofed house at the corner of Ambrose St. when 20 Brighton Rd. was purchased in 1906 as a manse. During that period the pillared portico was added. "Make Way for the Halifax Refugees!" On this the 100th anniversary of the Halifax Explosion, this personal account of a survivor, Betty Rogers Large, as told in her book Out of Thin Air, seems appropriate. When Dad was posted to Halifax in 1914, I was barely a year old. My sister Marianne was born there in October 1917, about six weeks before the tragic Halifax explosion. To help with the house Dad hired a maid, a girl named Sylvia Publicover who came from a place with the strange old name of Ecum Secum. We had an apartment within walking distance of the Citadel on Williams Street, which meant Dad could live at home when he was not on duty. 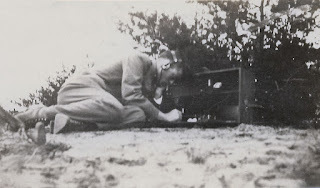 At that time the Citadel was a military intelligence center so it is difficult to ascertain precisely what Dad's duties were there I know from his papers that he continued his research and experimentation in wireless. From a receiving apparatus of his own construction, he was able to pull in, directly from Berlin and Paris, official communiques of the German and French general staffs. These were logged daily, and the information was forwarded to Ottawa. So it seems, through the years 1915-17, he was involved in some sort of wireless surveillance—probably one of the earliest forms of electronic surveillance in the history of warfare. 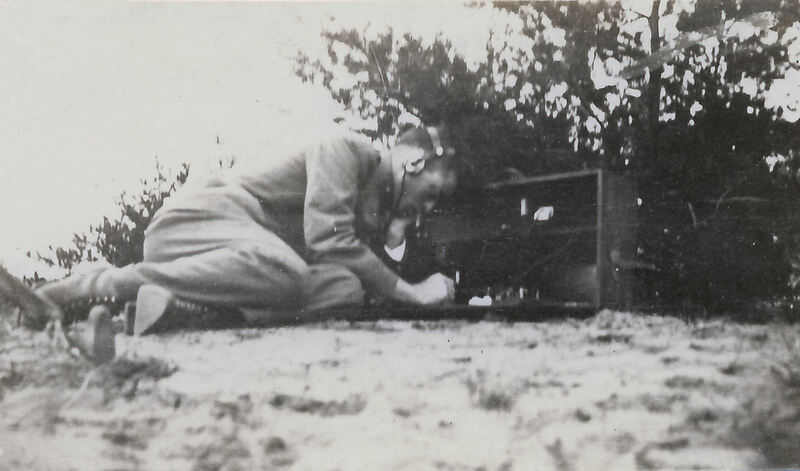 His routine duty at the Citadel was the maintenance of communications by visual telegraph—lamps and flags—and wireless telegraph with the various units comprising the fortress. During this period he was also seconded to the Royal School of Infantry and the Royal School of Artillery to train wireless operators. At age 23, he was promoted to Captain and placed in charge of all communications including the military telephone system. Each year he applied for overseas service, but his applications were turned down—much I'm sure to my Mother's relief—on the grounds of necessity for his service in Canada. I was too young to have any conscious memories of Halifax; but the story of what happened when it was devastated by the explosion caused by the collision of two munition ships, the Imo and the Mont Blanc, has been told so often, it seems as if I actually do remember it—so I'll tell it that way. It started just like any ordinary day. We were sitting around the breakfast table. Mother always said that if Dad had not had such quick reflexes, all of us, except baby Marianne, would have been killed. We had large dining-room windows, and as we looked out, we could see the man next door up on a ladder fixing his house. Suddenly, there was an awesome feeling of danger as an ominous swishing noise filled the air. "Under the table!" my father roared, grabbing me and throwing me to the floor. Sylvia, the maid, flung herself across Marianne's bassinet. As we huddled there pressed to the floor a shower of glass flew over us, embedding itself in the far wall. Shards of it had to be taken out of poor Sylvia's back. I still carry the scar where it cut my knee. The man next door was blown off his ladder, his body found over in the next street. Dad reported immediately to the Citadel, but before he went he took us to the Commons where the military was erecting a sort of tent city to house the thousands of fleeing homeless. We spent the night there in the open because there was fear of a second explosion. Outside, it was bitter cold; and to add to the misery, there was a heavy snowfall throughout the night which turned into a blizzard the next day. Death, fear, and pain were everywhere as thousands of victims lay in long rows at the hospitals and receiving stations waiting their turn to be attended or pronounced dead. Dad said people reacted quickly and courageously. Military and naval units organized search and rescue parties. Firemen fought desperately to bring raging fires under control. Doctors and nurses were operating as soon as schools, halls, churches and private homes could be set up as temporary hospitals. Special trains were arranged to bring help from the United States and the rest of Canada. Immediately the news of the explosion reached the Island, Grandfather "W.K. ", who was chairman of the PEI Hospital Board, organized a team of doctors and nurses and a cavalcade of cars to go to Halifax. All the Island roads were blocked with snow. Undeterred, they drove the cars along the railroad tracks. When he arrived at the stricken city, Grandfather went straight to our home, stuck his head in at the door and called out, "Is everyone alive and well?" Satisfied we were, he left at once for the Red Cross Headquarters. Those people with friends or relatives elsewhere who could take them in were evacuated from the city. Mother, Marianne and I were sent home along with many others on the Borden train. When we landed at the station in Charlottetown, men walked ahead of us on the platform calling to the crowds, "Make way for the Halifax refugees!" We remained on the Island for the duration of the war. A letter composed by William Keith Rogers was published on May 8th, 1934 in the Charlottetown Guardian. It tells of his efforts to have legislation reversed, during a period in which automobiles were banned on Prince Edward Island. William Keir Rogers (1868-1937) was born in Summerside, PEI. 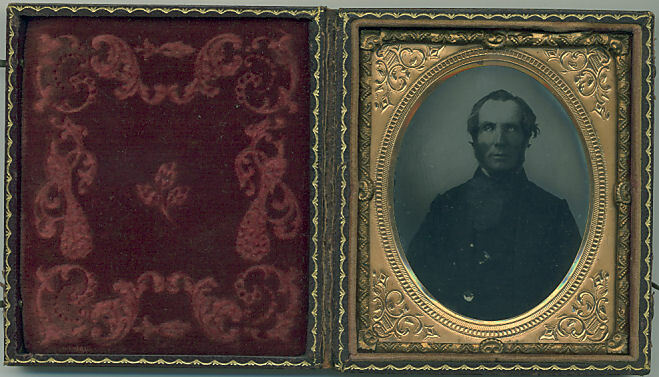 He was nine days old when his mother, Rebecca Burrows (1845-1868) died on 23 Apr 1868, and was raised by his Aunt Kitty (Catherine Burrows) and his maternal grandfather Thomas Burrows Jr., at the Burrows home in New Annan, PEI. Long known as W K, he also gained the name “Good Roads Rogers” from his efforts to improve the transportation system and more particularity to remove the motor vehicle ban on PEI. The automobile was called by one PEI resident, J. W. McNally as “Only a foolish fad of millionaires and fools.” While McNally was eventually proven wrong, his phrase like the automobile itself found longevity on PEI. Rogers’ developed skills as a telegrapher and began work at sixteen as a clerk and operator with the Prince Edward Island Railway (1884-1887). At nineteen two years after the last spike had connecting Eastern Canada to the West he accepted a position as station agent and dispatcher in Port Arthur (now Thunder Bay) with Canadian Pacific serving there during 1887 and 1888. In 1889 he married Margaret Sinclair (1868-1959), of Summerside when both were twenty-one, and the young couple moved to Sandpoint, Idaho where he had a similar role as station agent with the Northern Pacific Railway from 1889-1892. While part of a growing state, compared to the comforts of established communities on the East Coast it was a desolate wilderness location for his young wife, and thus they returned home after three years, bringing home souvenirs of their western adventures. A tomahawk with several notches (apparently indicating scalps taken by the original owner) and a stuffed caribou head trophy were reminders of their western experience. Their first child was born in 1892 in Summerside; eventually they had four children. On Prince Edward Island again, he embarked on a business career, starting as a bookkeeper for a firm of merchants, and from there he moved into a role as insurance agent in Summerside. 1888 had brought the invention of the safety bicycle with equal sized wheels and the model on which all modern bicycles are based. The innovation produced a world wide boom in the 1890s in bicycle manufacturing and sales. When an opportunity arose in New Brunswick, W K Rogers accepted a position as manager of Canada Cycle & Motor Company (CCM) in Saint John. CCM was established in 1899 as an amalgamation of four major Canadian bicycle manufacturers. CCM also became involved with manufacturing motor vehicles. Rogers indicates that a CCM motor vehicle, a 1906 Russell was the first new motor vehicle ever purchased on PEI. Rogers was the purchaser, and he replaced it with a 1907 model the next year. 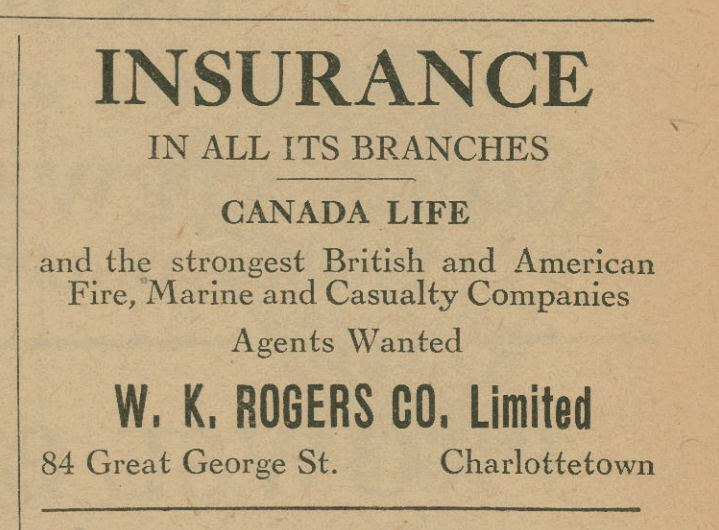 Advertising materials from Prince Edward Island lists Rogers as the general agent for Saxon automobiles, when the vehicles sold for $ 665. The Saxon Motor Car Company existed in Detroit, Michigan from 1914 to 1922. 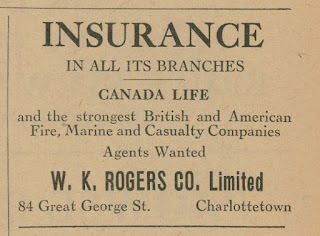 Perhaps best known for the insurance agency bearing his name, W K Rogers Co. Ltd., he established his long term role as a Charlottetown agent when he became provincial manager of Canada Life Assurance Company. After adding fire and accident insurance to his products, his business advertised Tickets from Anywhere to Anywhere when it was located on 84 Great George St., indicating he was offering steamship and train tickets, as well as insurance. The travel aspect of the business which drew on Rogers’ early experience, developed into a full service travel agency adding air tickets to their line and operating under the name W K Rogers Agencies. The business evolved since Rogers’ time as Morton Dew Travel, and contInues (2004), under newer ownership. In 1913, he made his first move into the lucrative silver fox industry on PEI, when fur farming was establishing a world leadership position on the Island. Buying foundation stock in 1913 from fur pioneer, Jim Tuplin his original five pairs of foxes developed until he was credited as being the largest individual silver black fox rancher in the world. In 1924 his ranches had a population of 1,000 even after having sold 300 breeding pairs and 200 pelts the previous year. According to Silver Fox Odyssey, by 1925 Rogers owned nine ranches and was called the “Morgan of the Fur Farming Interests.” At the high point of the fox business, he travelled to Europe to personally supervise the sale of his furs and breeding stock, had a private chauffeur while home, and was known for his philanthropic efforts. His fox empire included a silver fox company in Des Moines, Iowa which he was president of. His home at 139 Euston street in Charlottetown, a imposing three story house, designed by architect William Critchlow Harris, reflected his position in the community as a successful businessman. His fortunes saw a decline as the industry lost its luster. While foxes might lose value, they still needed to be fed. Eventually Rogers began to hear rumblings from his bankers, and family members relate a story of an occasion when the bank manager in the Charlottetown branch of the Bank of Nova Scotia, required repayment of a loan securing a ranch operation, at a time when Rogers didn’t have the cash to repay the loan. While Rogers always had staff to run his operations, he knew what was involved to keep the operation going. He waited until it was near feeding time to arrive at the bank, with a huge ring of keys to the fox pens in hand. The keys were handed to the banker, informing him that feeding time was approaching, and that banker could “feed them if you want to”. As Rogers was prepared to make a rapid departure, the ploy worked and the banker quickly realized the responsibility that came with ownership of livestock, and had a change of mind about demanding the immediate repayment of the loan, as well as about accepting the ring of keys. One of Rogers’ PEI ranches was the farm at the center of the current Fox Meadows Golf & Country Club in Stratford. Equipment used to grind food for foxes was still in evidence in a building on the property which was standing in the 1980's, as well as the remains of fox pen wire. He was credited with realized the importance of providing essential knowledge along with the sale of foxes and the introduction of the training school concept for fox ranchers which was conducted in conjunction with the sale of live animals. Biographical sketch of W K Rogers, by Marianne (Rogers) Morrow - his granddaughter. AUTOMOBILE HISTORY ON P. E. I. Sir: A few weeks ago an editorial in The Guardian headed "Good Roads Rogers" recalled to my mind many incidents in connection with the introduction and use of the automobile in Prince Edward Island. It occurred to me that much of the history of this period is totally unknown to many of the younger generation who are driving cars today, and that a short sketch of what occurred might be both amusing and interesting. As for any reference to myself as "Good Roads Rogers", we can let that pass. We all know that the introduction of the automobile was responsible for the good roads movement everywhere, and perhaps more so in Prince Edward Island than elsewhere. What I am going to write is from memory only and it is possible some slight errors may creep in, but in the main this account of what happened is substantially correct. The first motor vehicle brought to the Island of which there is any authentic record was a steam car that carried about a dozen passengers. It was owned by a syndicate of Charlottetown men among whom were the late George E. Auld and the late Donald Nicholson, and was brought to Charlottetown in about 1900 and was used to carry passengers around the city and through the park, the fare for the round trip being ten cents. Several trips to the country were attempted but with little success. 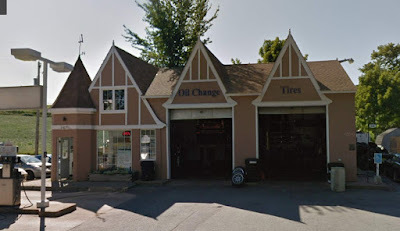 The first automobile was brought here in 1905 , T. B. Grady and Frank Compton of Summerside importing a second hand Ford, and F. R. Jost a second hand single cylinder Cadillac. In 1906 the late George E. Auld and the late J. A. S. Bayer bought the Ford from Grady and Compton, Jimmie Offer imported a big Oldsmobile, Dr. Alley a three cylinder "Compound" and I brought in the first new car, viz. a two cylinder double opposed "Russell" made by Canada Cycle and Motor Company, this making a total of five automobiles in the Province. Five, however, was enough to start trouble. In 1907 I changed my 1906 Russell for a 1907 model but I do not remember that any other cars were brought here. "Let the Government widen the roads to sufficient width for safety and comfort and I think very soon the fear will change from the man who drives the horse to the automobile owner, and soon harmony will reign and the automobile and horse will dwell together in safety and a little child may drive either." for upkeep was $170,000 and in addition $ 50,000 on capital account. On the other hand, however, automobile licenses amounted to $ 89,255 net, gasoline tax $164,313 net. "Total exclusion from the public highways." Signed Vernon Bridge. "$500 tax." Late H. W. Turner, O'Leary. "Only a foolish fad of millionaires and fools." Late J. W. McNally. "It may be all right for an undertaker to support the unrestricted running of automobiles. Necessary as is the calling of undertakers, and respectable as it may be, the intelligent electors of this Province will not support this modern death producer even for their benefit." Signed George W. McPhee in reply to the late D. L. McKinnon of Montague. "The proposition that the Government widen the roads for the convenience of autoists is too ridiculous to be seriously dealt with. As far as tourists are concerned we wish to encourage them in every way and for this very reason automobiles should be prohibited." Signed Late M. Trainor, Charlottetown. "Editor Patriot, Sir: Might I be permitted to inquire whose interests the "Guardian" proposes to serve , that of the merchants of this City and the people throughout the province or the handful of automobile owners. We wish to know clearly on which side of the fence you are." Signed Merchant. Editorial in Patriot: In yesterday's Patriot appeared a letter dealing with the automobile question and signed "Interested Spectator". The autoists were referred to as a small and upstart minority. This phrase escaped our notice in looking over the letter. We regret its insertion. The owners of automobiles here are among our most prominent and respectable citizens and do not deserve to be alluded to in this manner." During the March 1908 session of the Legislature the late Mr. John Agnew introduced a resolution asking for legislation to prohibit the running of automobiles on the public roads of this Province. The resolution was seconded by the late D. P. Irving. Mr. Justice Haszard, then Premier, speaking on the resolution said this was a burning question that had been agitating the minds of the people of this Province for some time. He was disposed to think that the mover of the resolution had not gone far enough. Chief Justice Mathieson, then Mr. Mathieson - leader of the Opposition, supported Mr. Haszard. The resolution was supported by the Hon. George E. Hughes, Hon. Matthew Smith, Mr. McMillan West River, and opposed by Hon. John M. Clark of Summerside, Mr. McKinnon and Mr. McDonald. And so the famous Automobile Act which was to cost this Province at least several millions of dollars in tourist traffic was passed. It provided against the use of any motor vehicle on any public highway or street in the Province, and a motor vehicle was defined as all motors, automobile or vehicles propelled by any power other than muscular power except such vehicles as run only on rails and steam road rollers. The penalty for an infraction of this Act was a fine of $ 500 or six months in jail. It is impossible to estimate in terms of dollars and cents what the passing of this Act cost the Province. The tourist trade was already looked upon as a great source of revenue by all countries that had sunshine, scenery, good fishing and good food to offer. Prince Edward Island had all these and more and we were already well advertised, and were getting the business. This legislation came just at the tie the automobile had become so developed as to be used as a safe and convenient method of transportation, and the wealthy tourists were leaving trains and steamboats and taking to their automobiles. We deliberately shut them out totally from 1908 to 1913 and really until 1919 for although the 1908 Act was repealed in 1913 autos were only allowed to operate on three days a week on certain roads until 1919, and tourists would not come here under these conditions. Placing an estimate of half a million dollars yearly on the tourist traffic turned away is, I believe, a most moderate estimate. Eleven years meant a loss of at least five millions of dollars. However, that’s that. And now the war began all over again, those in favor of the running of the automobile becoming the attacking party, the war to be continued until the motor car was allowed to operate on all roads and streets in the Province on every hour of every day of every week under proper regulations. The majority of those who took part in that war have passed away but it was a glorious eleven year war. Although the passing of the prohibitive legislation was an Act of the Liberal Government the Act was supported by as many Conservatives as Liberals, but once having passed the legislation the Liberal party appeared to feel it their duty, to support their child so the question soon became a political one. "This evening on the St. Peters Road and on the streets of Charlottetown at 6:30 I will operate my automobile. Signed W. K. Rogers". I was called up and personally interviewed by parties who begged me to desist and by some who threatened me, but that evening we went out, five of us - Bruce Stewart, George E. Auld, James A. S. Bayer, Dr. Gordon Alley and myself. I have a photo of us taken at Johnston's Drugstore corner by R. M. Johnston. We ran out the St. Peters Road and around Charlottetown for about an hour and then put the automobile in my barn where it remained until the following Spring when I had it towed to the Steam Navigation Wharf and shipped it to Sydney. Of course I expected to be arrested or served with papers that evening or the next day, but nothing happened and finally we were obliged to get someone to lay a complaint. I then came up before the City Magistrate, the late John MacDonald, and he fined me $ 500 or six months in jail. We then appealed it to the Supreme Court and Mr. A. A. MacLean was good enough to give his legal services without remuneration for himself. We knew the law was perfectly sound but we were obliged to keep the question before the public. The automobile was becoming popular and necessary as a means of transportation everywhere and someone had to keep up the agitation against this damaging and ridiculous legislation. The decision of the Judges on the appeal was handed down at the June 1910 session of the Supreme Court. I was foreman of the Grand Jury that year and in our report on the condition of the public institutions I did unmercifully condemn the old jail, then on Jail Square. His Lordship, Chief Justice Sir W.W. Sullivan, was on the bench and he whispered to me, "Rogers, you cannot get clear that way; we are going to build a Jail." You see he had the decision of the appeal Judges in his pocket. During the period from 1908 to 1912 the question whether the automobile should run or not run in Prince Edward Island was debated in the press and at meetings and it was undoubtedly the issue in the 1912 and 1916 elections. We had no difficulty in winning the 1912, and Chief Justice Mathieson came in as Premier, and at the first session in 1913 the old Act was repealed and an Act passed permitting the operation of motor vehicles on three days a week, viz. Monday, Wednesday and Thursday on the streets of Charlottetown and Summerside, and on such roads as might be declared open by order of the Governor in Council. Those who had been fighting the battle for the automobile strongly urged upon the Government at the 1913 session the wisdom of disposing of the question completely by passing a regulating act such as was working out successfully in the other Provinces and permitting their use on all days and on all roads. Our efforts, however, were unsuccessful, and the sore remained through the period from 1913 to 1919 when Mr. Justice Arsenault, then Premier, disposed of the question in a common sense manner and so ended the long dispute. In the 1915 election we realized that a return to power of a Liberal Administration would probably mean they would nurse their automobile child along. It was therefore up to us to win the election and return the Conservative party to power. In working out our plans we went over the different districts, found out the sure Conservative and the sure Liberal, and wasted no effort on them, but concentrated on five constituencies that were doubtful, but which we believed could be carried. We won the five of them and the Conservatives came back. I remember that a few days before polling, R. H. Sterns and myself started out to raise some more funds. We commenced at the lower end of Queen Street at about ten o'clock in the morning and finished at Jamieson's Drug Store about twelve o'clock with $ 500. cash. We had many amusing experiences on our trip up Queen Street. The late Os Hewitt refused to give us a cent. Sterns held him while I took his watch which he redeemed for twenty dollars when he overtook us further up the street. Jamieson refused to give anything: Sterns held him and I took twenty dollars out of the till. After the house prorogued in 1913, we went to the Premier and asked him what roads the Government proposed to open, and we were informed that they had decided not to open any roads without a petition signed by at least 75 per cent of the voters on that road. We had in mind the restoration of the tourist trade and the first roads we attempted to open were from Charlottetown to the Cliff Hotel, St. Peters Road to Union Road Corner, Union Road to Guerney Road Corner, then to Stanhope. We had to wait until the roads dried up before we could do anything. Then we made up three teams of canvassers - George E. Auld and George McDonald, L. H. Beer (now Col. Beer) and Dr. Alley, Bruce Stewart and myself. We would meet on the market square about ten o'clock, three horses and wagons, and be back at night with at least eighty percent of the names from the districts we had canvassed. We soon opened that road and very shortly extensive work began improving this road until it was the best on the Island. This example set the ball rolling, and the roads were gradually opened up. We had a great automobiles drove all the people along the road from Charlottetown to the Cliff to the picnic. The night before the picnic the people on the Brackley Point road held an anti-auto meeting at picnic at the Cliff Hotel the summer the road was opened, and the Harrington, at which some violent speeches were made and an anti-association formed at which a gentleman residing on the Union Road beyond the Gurney Road turn was elected President. On the day of the picnic after we had all the people transported to the Cliff. Auld said to me, "I see Mr.---- was elected president of the Anti-Auto Association at Harrington East last night. Suppose we bring him to the picnic?" So away we went, and after a very excellent lunch we had the newly-elected President making a very fine speech on the lawn of the Cliff Hotel in the favor of the running of automobiles. This picnic was an annual event for several summers. And so the feeling in favor of the automobile spread. In 1914 war broke out and we did not pay much attention to days or roads when called upon to help in recruiting or war work, and I think in only two cases were complaints laid, both against myself. The first was when the late Col. S. R. Jenkins ordered me to take him to Tignish after a deserter. They fined me $ 200 or two months in jail. The second was for taking Lieut McLean to Georgetown to see his family before going overseas. Lieut McLean arrived. in Charlottetown from Val Cartier on the late train Saturday night and was sailing overseas from Halifax on Tuesday. Sunday morning he tried to get a team but could not do so, and after church the late Rev. Geo. C. Taylor called me up and asked me to take McLean home and I at once said that I would. They fined me $ 200 also for this. We got the case adjourned about a dozen times and had a lot of fun. I paid no fines in any of these cases in which I was convicted, and what was the use of sending me to jail at the expense of the Government. When the Victory Loan campaign was started in 1917, Mr. C. H. B. Longworth was appointed general Executive Chairman for the Province and I was appointed Chairman and organizer for Queens and Kings Counties. This meant my travelling over every part of the two counties, and it is difficult to see how the work could have been done in the short time alloted to us. I used my automobile on every day of the week, sometimes speaking at four meetings a day at places many miles apart and scarcely ever getting home before midnight. The people everywhere were kind and considerate, and no one ever suggested that I was violating the automobile law every day. Especially do I remember the courtesy of Mr. J. A. Dewar of New Perth. Mr. Dewar had been one of the strongest opponents of the automobile, but after a night meeting held in the hall at New Perth he came out with me to my car and took great pains to explain to me that the best road to Charlottetown was such and such, totally ignoring the fact that I was violating the law by running my automobile on any road on that particular day. I held the same position with the Victory Loan in 1918 and 1919 and did the work In the same way without any complaints. Of course in 1919 the new Automobile Act was in force and the trouble was all over. As I said at the beginning this should be of some interest to the younger generation, possibly to some of the older. It makes me feel rather sad as I review this period and our fight, to find how few of us are left. 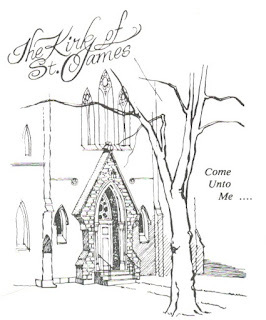 The Kirk of St. James, Presbyterian Church, in Charlottetown has updated its history booklet three times: the 1962 version, as well as the 1982 revision, and the most recent in 1992 are all available online - as well as a document, The Women of The Kirk. There is a brief illustrated history on the congregational website with historical pictures. A self-guided tour brochure is also available on this blog. 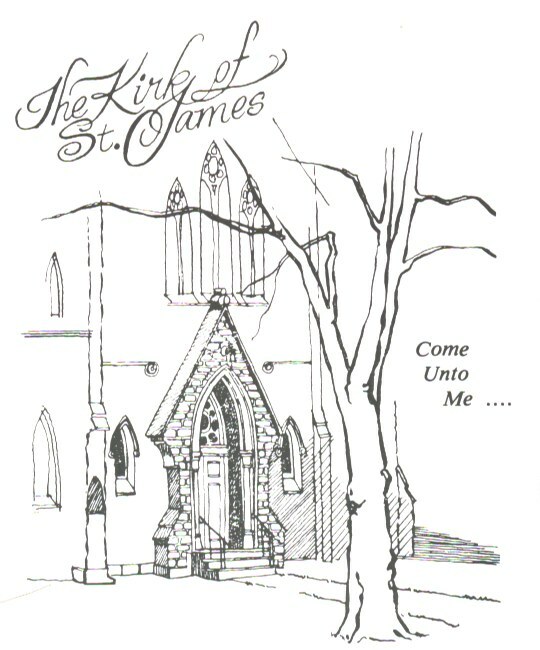 The Kirk of Saint James, at the corner of Pownal and Fitzroy Streets, has been a place of Presbyterian worship since 1831. This Congregation is the mother church of Presbyterianism in this part of Prince Edward Island and it has endeavoured to maintain the noblest traditions of the worship and witness of the Church of Scotland. When the British assumed control of Ile Saint Jean, settlers from the British Isles began to make their way across the Atlantic. Although Presbyterians arrived on the Island from Western Scotland as early as 1770, it was not until 1791 that a minister from Pictou, Nova Scotia, the Reverend James MacGregor, was able to provide occasional visits to the fledgling congregation in Charlotte Town. 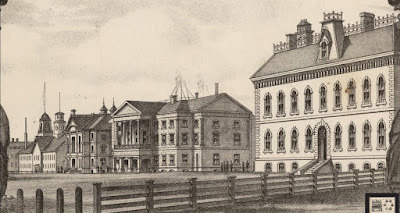 In the thirty years that followed, Mr. MacGregor made numerous visits until other ministers came in sufficient numbers to make possible the establishment of a Presbytery in 1821. In the late 1770's, funds were sent out by the Imperial Government in London for the erection of a church at Charlotte Town. Instead, these monies were used to pay the overdue salaries of government officials. Consequently, for the remainder of the eighteenth century, services of worship were conducted occasionally by visiting ministers in the Crossed Keys Tavern, which was situated in the vicinity of the present north-east corner of Queen and Dorchester Streets,in public buildings and in private homes in Charlotte Town. In 1796, additional funds arrived from overseas and work began at last on the building of a place to worship on the western part of Queen's Square for the use of the Established Church of England and the Church of Scotland. This building stood for thirty-six years and was used by the Presbyterians for the first twenty-five years of that period. In 1825, a separate Presbyterian congregation was founded in Charlotte Town. The first record of this congregation is a public meeting held in the old Court House in June, 1825. At this meeting, it was unanimously resolved to open a subscription list to obtain monies for the building of a church, It was also resolved to apply to the Established Church of Scotland for the appointment of "a learned and pious clergyman." The Honourable John Stewart, Speaker of the House of Assembly, made the offer of a town lot on behalf of its owner, Alexander Birnie of London, England and Mr. William Johnson offered an adjoining lot. These offers were gratefully accepted and the first Kirk was completed in 1831. The deed for this land was written on heavy vellum paper with a quill pen and is dated September 30, 1825. It is stored for safekeeping with other valuables of the congregation. In 1790, the land had been owned by Dr. Alexander Gordon, the son-in-law of the first Lieutenant Governor of Prince Edward Island, Walter Patterson. 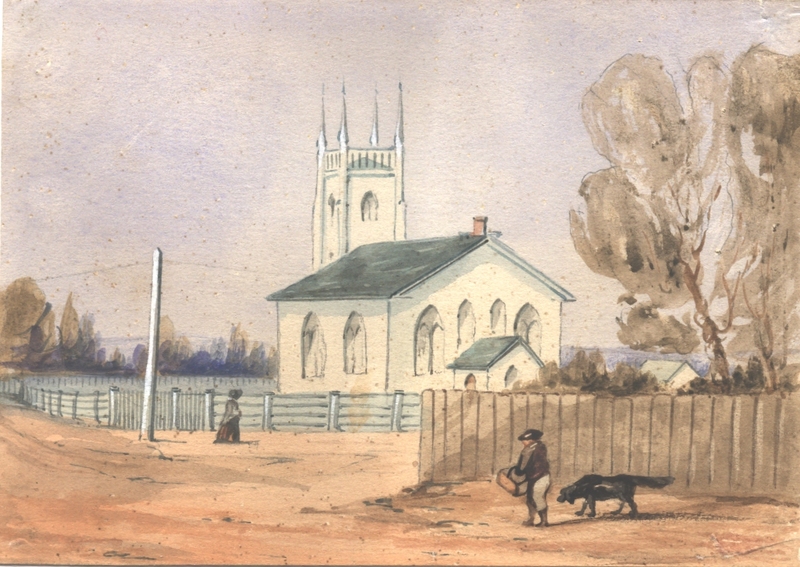 In 1826, construction commenced on the first Saint James Church at the corner of Pownal and Fitzroy Streets. 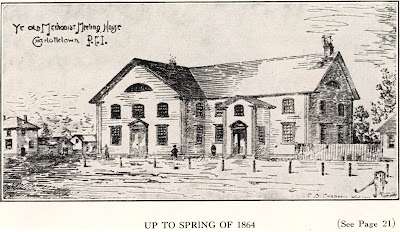 On Tuesday, August 9, 1831, the building was dedicated for worship. On the same day, the Reverend James Mackintosh, who had been sent out by the Glasgow Colonial Society of the Church of Scotland, was inducted as the first minister. The building was completed before 1831, but wasn't dedicated until Mr. Mackintosh arrived. The first Kirk was described as "a large, comfortable and commodious building housing the elite of Charlotte Town at worship" and gave the impression of "size, magnificence and grandeur." The first Kirk was moved to a site north of the manse and served as a Sunday School for seventeen years after the completion of the second Kirk in 1878. Under the ministry of the Reverend Dr. Thomas Duncan, the congregation grew to a point where a larger and more suitable sanctuary was needed, and the decision was made to build a new, larger church. The Reverend Kenneth MacLennan, a minister with unusual gifts as an artist and architect, worked closely with the designers. The Kirk was designed in early Gothic revival style by Mr. David Sterling of the firm of Sterling and Dewar of Halifax. 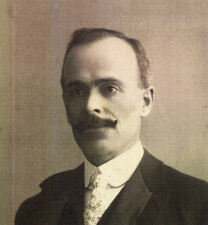 W.C. Harris, the well known Charlottetown architect, was associated with Mr. Sterling in the construction and supervision of the building. Messrs. MacDonald, MacDonald and Fraser of New Glasgow, Nova Scotia, were the builders and the contract price was $20,000.00. The Kirk was built of Wallace, Nova Scotia freestone, with doorway facings, buttresses and windows of Prince Edward Island sandstone. The building is seventy-seven feet long, fifty- five feet wide, fifty-nine feet high with walls eighteen inches thick. The tower has walls twenty inches thick and the spire reaches to a height of one hundred thirty feet and constitutes one of its most striking features. 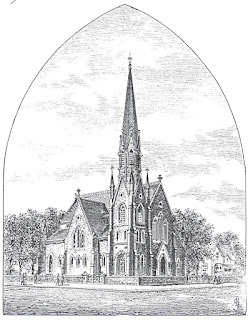 The cornerstone was laid by the Reverend Kenneth MacLennan on June 7, 1877 and the building was opened and dedicated to the Glory of God on October 20, 1878. As originally designed, the pulpit and choir gallery were incorporated into the North wall, with a gallery on the other three sides. The clerestory windows allowed light to shine on the pulpit area and the ceiling was light. In 1895, the Kirk hall was completed at a contract price of $3,612.00 and the first Kirk was partially dismantled and moved. Mr. A. Kennedy, an Elder and Sunday School Superintendent, laid the cornerstone for the hall. In 1898, a fire destroyed the original ceiling. W.C. Harris designed the present ceiling, which is one of the most beautiful examples of groined vaulting on Prince Edward Island. In 1931, the original seating layout was changed, creating a centre aisle running east and west to the newly erected chancel area. The gallery was removed on all but the east wall. This change brought back the feeling of height. In 1965, the Kirk hall was renovated and extended toward the north to provide a minister's study and additional classroom space for the Church School. Many of the rooms have been furnished in memory of former members of the congregation. Although the records are not as complete as is desirable, the sources that are available provide information on these matters of concern to the congregation of the first Kirk. One of the earliest mentions of the Ladies of the Church occurs in 1851, when they were thanked for procuring a bell from the United States for the Church. It seems that the ladies were free to make the money but were not at liberty to spend it without the consent of the Trustees. The Ladies' Bazaars realized large sums of money, which were given to the Trustees for various projects. On October 7, 1853, three members of the Kirk drowned when the ship "The Fairy Queen" sank in rough seas. 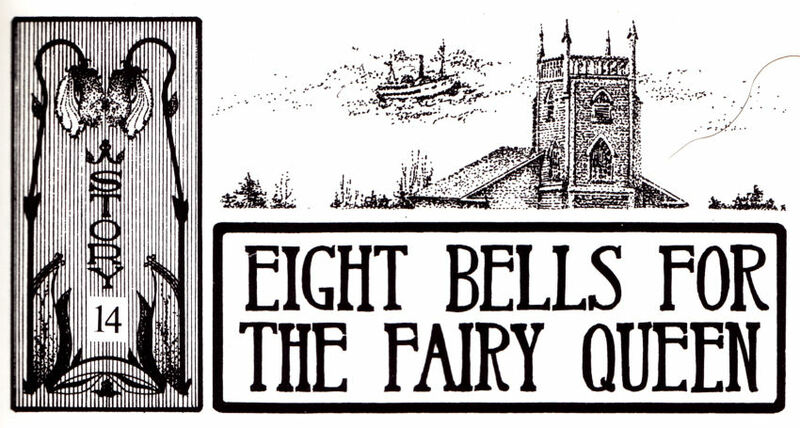 The story of the phantom bell-ringers and its strange coincidence with the wreck of the Fairy Queen is an interesting legend connected with the Kirk of Saint James. To this day the weird experience of Captain Cross, Davy Nicholson, the beadle, and Reverend Snodgrass is accepted for what it's worth. Were there three or four mysterious ladies involved in ringing the Church bell early that morning? In the early years, pew rent was collected from the congregation. The 1855 cost per sabbath was as follows: "A" seats - 60 cents, "D" seats - 30 cents, and the gallery 5 to 10 cents. 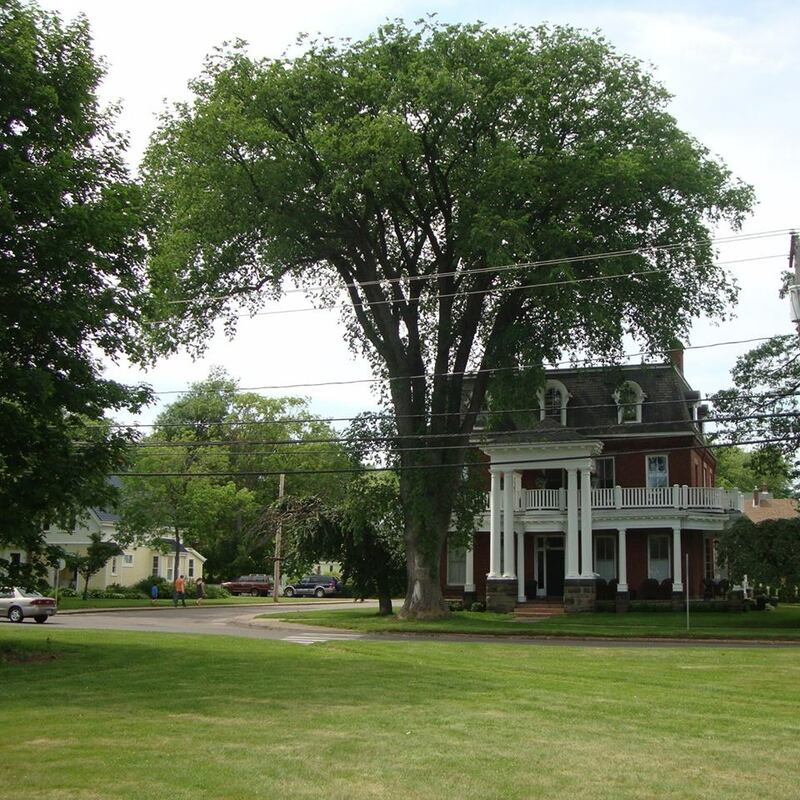 In 1855, the decision was taken to build a manse. On July 9, 1857, the Trustees ordered a "necessary" to be built on the manse grounds. In 1858, there was a strike of the choir at Saint James Church. 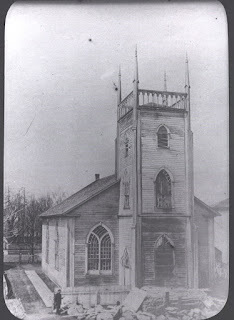 In 1861, gas lighting was installed in the Church. In November 1866, the Session and Trustees met to consider the propriety of purchasing an organ. In September 1867, Presbytery sanctioned the purchase of the organ. 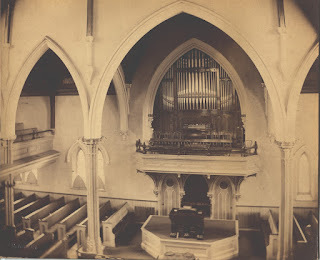 In 1867, the organ was installed. The first music played on it was the One Hundredth Psalm during a service on November 10. For $425.00, the congregation had an eight stop organ in a walnut case. The organ was built by Mason and Hamblin of Boston. In 1871, the pulpit was removed and the minister was supplied with a desk and a couch. The innovation was short-lived. In 1872, pew rents were abolished in favour of voluntary collections. 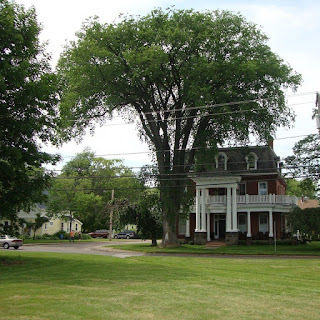 In April 1875, the trees on the Church grounds were transplanted to the edge of the sidewalk. In 1876, a decision was made "not to support the formation of a third Presbyterian congregation in Charlottetown." On October 20, 1878, the second Kirk of Saint James was dedicated. The congregation sang Dr. John MacKieson’s dedication hymn. In 1878, pew rents re-appeared due to the building of the second Kirk. In 1885, the Presbyterian Hymnal of the Church was adopted for use by the congregation. In November 1885, Saint James Church was closed by the Board of Health due to a smallpox epidemic. In 1885, annual reports were printed for the first time. In 1891, the ministers of Saint James Church and Zion Church exchanged pulpits on a regular basis. On April 13, 1891, a motion was passed which gave the Charlottetown Light and Power Company the authority to wire the Church for electricity. In June 1892, the congregation discussed a scheme to place a pipe organ in the Church. In 1893, permission was given for an organ recital. However, it was not to be held in the week before or the week after communion. In 1893, while attending Normal School to become a teacher, Lucy Maud Montgomery, author of "Anne of Green Gables," attended the Kirk from time to time. In 1896, the Trustees approved the purchase of a magic lantern and a piano. On April 11, 1898, there was a fire at the Church which caused extensive damage. 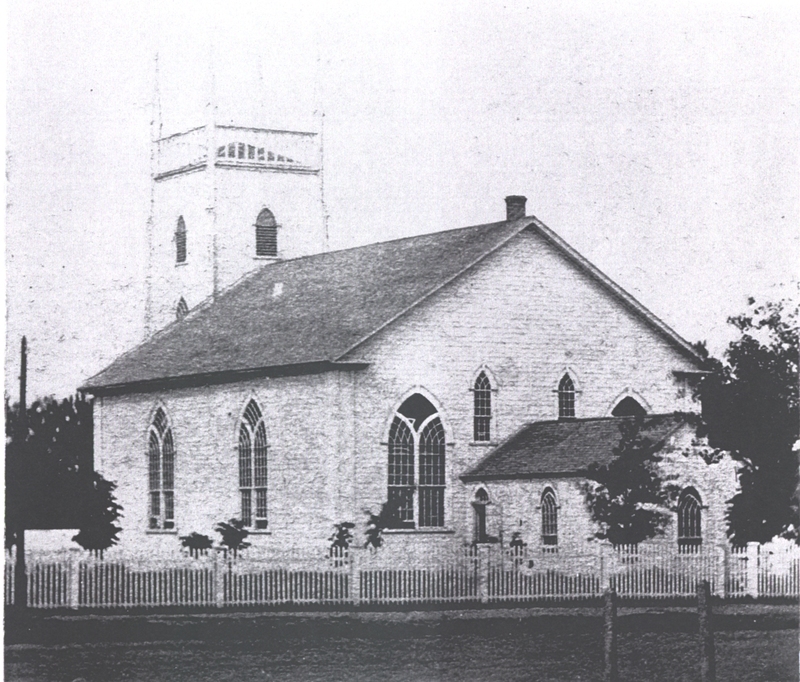 Church services were held in the Church Hall until November 28, 1898. On December 3, 1900, the Trustees resolved to have the Sewerage Commissioners connect the school basement with the system. In January 1904, the Light and Power Company installed a meter to measure the amount of electricity used. 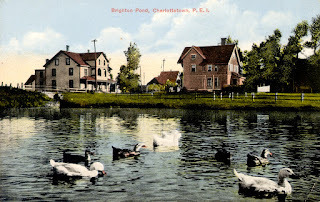 In March 1906, a new manse, situated on Brighton Road, was purchased for $3,500.00. In December 1910, the choir of Saint James Church requested leave to wear black gowns and mortar boards. In 1920, there were joint services with Zion Church during the summer months. December 26, 1924, was the date set to vote on church union, under the "United Church of Canada Act" passed by the Federal Parliament of Canada. On January 14, 1925, the results of the vote were announced: for union - 20%, against union - 80%. 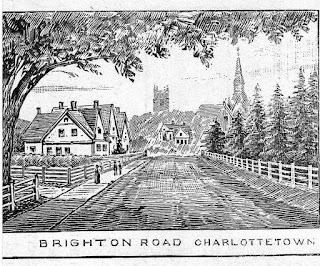 In November 1925, the manse property on Brighton Road was sold. A new manse was to be built on the Church property. In June 1926, the tender of Messrs. H. and S. Lowe to build a new manse on Pownal Street was accepted. In 1928, the Trustees sold a lot on Pownal Street for $1,200.00 and a lot on Ambrose Street for $750.00. In 1935, the Trustees sold the Pollock property on McGill Avenue. On March 1, 1936, the Church service was changed from 11:00 a.m. to 10:00 a.m. so the congregation could be home to listen to the first broadcast of H. M. King Edward VIII. In 1939, the Annual Reports were sent out by mail together with a letter that requested a ten percent increase in contributions. In 1942, war-risk insurance was added to the insurance coverage on the Church. In 1944, communion cards were distributed instead of tokens. In 1946, there was a three month trial given to the printing of a church bulletin. In July 1947, an oil-fired boiler was purchased from the Department of Public Works. In 1947, elders began the delivery of communion cards. In February 1950, sketch plans for the proposed kitchen were presented. The wishes of the ladies with respect to the kitchen were to be accepted, as they were paying for the work. In October 1950, a pew was set aside for the Lieutenant Governor, His Honour T.W.L. Prowse. In January 1957, the lowest tender for fuel oil was accepted at 18.6 per gallon. In June 1958, approval was given to install a water heater in the kitchen in time for the Fall Tea. 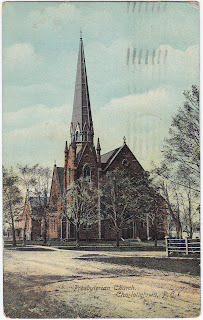 In April 1969, Church Services were cancelled due to an oil spill at the Church by Charlottetown Petroleum Products. In April 1971, the cleaning and refinishing of the pews was completed. In May 1974, the bank informed the Board of Trustees that the interest rates had increased to 11% on their loan. In December 1974, it was suggested that the total Church debt of $22,000.00 be paid off in 1975 as the Church’s Centennial Project. In 1978, during the one hundredth anniversary service of the second Kirk of Saint James, Dr. John MacKieson's dedication hymn was sung once again. Many bequests had been received over the years which helped the financial cituation at the Kirk. One of the outstanding features of the Kirk is the beauty of its stained glass windows. These windows portray some of the great events in the life of our Lord and tell the story of Faith from its earliest origins in the Old Testament times through the Gospels and Epistles. The subjects and symbols of these windows are an inspiration and a stimulus to worship. In the archway over the main door on Pownal Street is a window depicting Christ the King holding the orb of world dominion. His hand is raised in blessingupon all who enter to worship and adore. This figure of the Saviour King is surrounded by Cherubs in heavenly glory. This memorial, a tribute to Dr. and Mrs. V.L. Goodwill, was the gift of Dr. and Mrs. W.L. Bailey. The window was dedicated in 1953. To the left of the main entrance, in the former choir vestry, is the beautiful little David of Israel window. This was given by Hazel Callbeck and daughter Claudette in memory of Mr. L.C. Callbeck, a noted Agriculturalist, a long time choir member and elder of this congregation. The symbols that surround the figure of David portray his interest in agriculture and his leadership qualities and make this a particularly appropriate memorial to Mr. Callbeck. The next two windows are the MacKenzie Memorial windows. The first is of Saint Cecilia, the patroness of music, who holds an organ. A lyre appears at the top of this window. The other is of Saint Hilda, the patroness of women teachers, who holds a book of music. A lamp of learning appears at the top of this window. These windows are a tribute to the talents of Edith Lillian MacKenzie, Mus. Bac., F.M.C.M., Organist and Director of Choirs for almost twenty years. Over the door of the Fitzroy Street entrance is a window in memory of Mr, and Mrs. Fred Smith which was given by their five sons. It is comprised of one trefoil and two quadrafids depicting an equilateral triangle, the tablets of stone and the serpent, and the beesand beehive resting on a bible. Mr. Smith was a church officer for fifty years. At the base of the tower are four small windows; the rose, the thistle, the lily and the burning bush. These were given by the Presbyterian Women in memory of the women of the congregation. The nave is ringed with many beautiful examples of stained glass. High on the South wall and facing Fitzroy Street is a massive and colourful portrayal of the Good Shepherd. The adjoining panels display the scrolls symbolizing prophecy and evangelism. This window was the gift of the Honourable J. C. Pope and William Welch, and was the result of an election wager. On the lower South wall are three groups of windows. The first panels portray the two great figures of the Old Testament, Moses and Isaiah, who represent the Law and the Prophets. Moses holds the tablets of the Ten Commandments, and Isaiah holds the scroll which foretells the birth of the promised Messiah. These windows are a memorial to Mr. and Mrs. J.E.B. Macready. Next are three windows which are the Congregation's memorial to those who gave their lives in the Second World War. The figures of Saint Stephen, Saint John and Saint Timothy portray the heroism and sacrifice of all who died in national service for the cause of honour and freedom. In the upper reaches of these windows are the Coat of Arms of the Dominion of Canada, and the Province of Prince Edward Island and the City of Charlottetown. At the base of each in turn is the crest of the Navy, the Army and the Air Forces against a background of Canadian Maple Leaves. These windows were unveiled on November 13, 1949, by Mrs. Melville Andrew and Mrs. Lorne Stewart, mothers of boys whose lives were given in our defence. Next are panels which portray the two great figures of the New Testament, Saint Peter, the Apostle to the Jews, and Saint Paul, the Apostle to the Gentiles. Saint Peter holds the keys of the Kingdom, and Saint Paul the sword of the Spirit. These two were given in memory of Mr. and Mrs. Charles A. Hyndman. Above the door in the Prowse Memorial is a beautiful Good Shepherd window. This window, a memorial to Mrs. T.W.L. Prowse, was given by the Honourable T.W.L. Prowse and family. High on either corner of the West wall are two jewel-like windows. That on the left depicts Saint Andrew, the patron saint of Scotland. That on the right depicts Saint Nicholas, the patron saint of Aberdeen. Below the Saint Nicholas window is one that portrays the figure of Hope. These three constitute a memorial to Mrs. J.R. Burnett whose Christian name was Hope. The Chancel window, “I Know That My Redeemer Liveth,” is adorned with many symbols. It was the gift of the MacKinnon family in honour of their parents, early members of this congregation. Over the Holy Table in the Chancel are two smaller windows. One portrays our Lord with the chalice of Holy Communion and the other portrays Saint James, the patron of this congregation. Saint James has the pilgrim’s staff in hand and the traditional scallop shell of his apostleship in his cap. These two windows are a memorial to the Goodwill family. On the North wall of the Reverend Dr. T.H.B. Somers Memorial Chapel are two windows in tribute to a former minister of the Kirk and his wife, the Reverend Dr. and Mrs. Thomas Fraser Fullerton. The first window portrays Saint Kentigern, the patron saint of Glasgow, the city of Dr. Fullerton's birth and education. 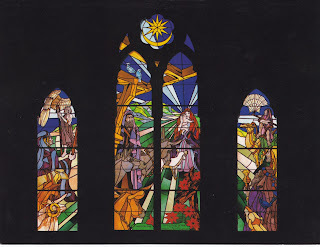 The Glasgow Cathedral which contains the shrine of Saint Kentigern (Saint Mungo) is shown in the lower right of this window. The adjoining window, a memorial to Mrs. Fullerton, whose Christian name was Margaret, portrays Saint Margaret of Scotland. The upper portion of this window depicts Edinburgh Castle, the centre of Saint Margaret's great work in the restoration and extension of the church of Scotland in the eleventh century. Next is the Aubrey Blanchard Memorial window in honour of a young engineer who drowned in the St. Lawrence River in 1905. He was the son of Dr. and Mrs. E.S. Blanchard, the first couple married in the second Kirk and the step-grandson of its architect. Next are two windows in memory of Mr. J.R. Burnett, who was an elder of this congregation for many years, and an editor of the "Charlottetown Guardian." The first window portrays Saint Ninian, who was the first Apostle of Scotland. In the panel below is his little church at Whithorn, the first stone sanctuary in Britain. The second window portrays Saint Columba, who was the sixth founder of the great Iona mission, and the Apostle to the Highlands. The panel below features a little coracle, the vessel which carried Saint Columba and his monks across the sea from Ireland. The musician's lyre and the Boy Scout fleur-de-lis, in opposite corners of these windows, represent Mr. Burnett's generous sponsorship of the Boys' Choir and the Scout Troop. In the upper left corner of the East wall is a small window depicting the interpretation of Revelations 3:20 “Behold I stand at the door and knock.” Next is a large window which portrays the Resurrection. This window is a beautiful tribute, given by Archibald Kennedy, in memory of his wife, Mary Crawford McLauren, who died in 1899. The other two windows in this memorial are filled with sacramental symbols, seraphs and angels in glory. Under the gallery on the East wall are two windows. One portrays Saint Mark, the evangelist with his distinctive symbol, the lion. The other portrays Saint Luke, the beloved physician with his symbol, the ox. The former is in memory of Mrs. Augusta Gill and her three daughters and was the gift of her son-in-law and grandsons, the Monteith family. The latter, in memory of Mr. H.A. Stetson, was the gift of his wife. In the Church hall, the large window on the Fitzroy Street wall is entitled "the Hosts to God." It portrays Mary, Joseph and the baby Jesus surrounded by all the animals that are mentioned in the gospel story of the nativity. This window was the gift of Charles and Ruth MacKenzie and is an Island product. It was designed by John Burden, created and installed by Blaine Hrabi and constructed under the supervision of Peter Hyndman. The Holy Table which served as the pulpit before the changes in 1931. The elders’ chairs on either side of the Holy Table, a memorial to Mrs. Ina Gillan Beer, were given by the Kirk Auxiliary. The minister’s chair was the gift of Miss Katharine M. MacLennan in honour of her mother, Mrs. A.E. Morrison. The Pulpit was given in tribute to the late J.E.B. McCready (1838-1930). The Pulpit Fall with embroidered cross was presented by Mrs. Charles Hyndman in 1927. The Chancel Rail, in memory of J. W. Morrison, Chairman of the Trustees and Building Committee during the building of the second church, was the gift of his son. The brass adornments of the Holy Table were all gifts to the congregation; the Alms Basin and Offering Plates were donated by Colonel Moodie of Hamilton. The plates now serve in the Church School and have been replaced by larger offering plates, which were donated by Professor and Mrs. W.L. Bailey. The larger brass vases were the gift of Miss Katharine M. MacLennan, in memory of her father, David Ross MacLennan 1850-1919. The smaller brass vases together with the organ lamp were memorials to Dr. Robert D. MacKinnon, 1878-1948 and were the gift of his wife, Mrs. MacKinnon of Narberth, Pennsylvania. The Celtic Chancel Cross was dedicated on December 4, 1977, in memory of Jessie Delores Walls, and was given by her husband Dr. R.J. McClenaghan of Ottawa. She is remembered at the Kirk as Mrs. T.H.B. Somers. This Saint John's Cross is a replica of a tenth century cross that stood before the west entrance to Iona Cathedral. This Cross sits on a tri-step pedestal which was given by the Enman family in memory of Margaret Elizabeth Enman 1937-1947. A silver plated lectern, a memorial to the Reverend W. Bruce Muir, was dedicated on August 10, 1980. This memorial was the gift of Mr. Muir's daughter Ina, now Mrs. Alex Frew of Hollywood, Florida. It is used to support the minister's book during communion services. The oak lectern was the gift of Mrs. A.E. Duff. The Bible and the blue silk markers on the lectern were gifts of the retired Church officer, Frederick Smith, a tribute to three of his friends, J.R. Burnett, D.A. MacKinnon and A.E. Morrison, elders of this congregation. The Bible was dedicated in October, 1953. The music stand was given by the Black family. The oak hymn boards were the gifts of Mr. and Mrs. Louis Sadler. The two oak Communion token trays were the gift of a former Session Clerk, Mr. N.D.
MacLean, J. P. These were made by Mr. MacLean to match the two older trays. The choir offering pouches, in purple silk, embroidered with the Greek Cross in gold, were the gift of Mr. and Mrs. Lorne C. Callbeck. The Bible of the Duncan family was given by Mr. and Mrs. James Enman.Flower stands, in memory of family members, were donated by the MacLeod and the Perry families. The jardinieres were presented by the Central Group to the Glory of God in loving memory of Hazel Brownrigg Roop - 1980. Plant stands, in memory of Edith Lillian MacKenzie, Mus. Bac., F.M.C.M., Organist and Director of Choirs, were given by Doris Tait and Mabel Matheson. The Baptismal Font of white marble was the gift of a group of young women of the congregation. It was built by Sanford of Halifax and was dedicated and used for the first time in January, 1898. The colours of the Prince Edward Island Highlanders, originally the 82nd Regiment, the Abegweit Light Infantry hang over the Chancel. 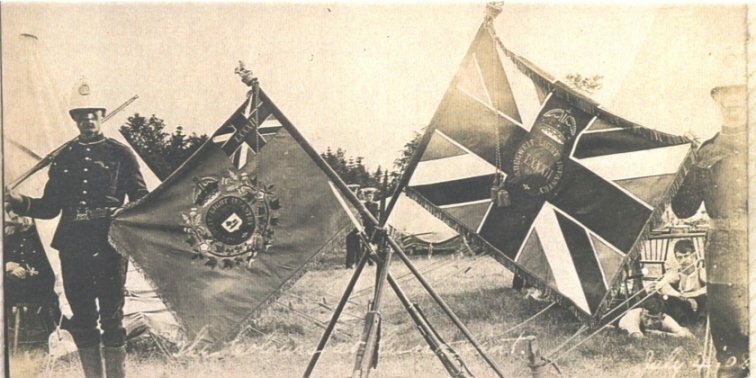 These colours were purchased in London and presented to the Regiment in a ceremony in Victoria Park on July 4, 1908, by Mrs. D.A. MacKinnon, wife of the Lieutenant Governor, and by Mrs. Daniel Stewart, wife of the Commanding Officer of the Regiment. The Reverend T.F. Fullerton, Chaplain, was among those present on the occasion and gave an address. Church authorities accepted the colours for safekeeping on August 6, 1922, at the request of Colonel V.L. Goodwill of the battalion. To the right of the chancel is the Dr. T.H.B. Somers Memorial Chapel. This chapel, established in 1967 to honour a devoted ministry of almost twenty-five years, perpetuates the memory of those whose lives have enriched the ministry of Christ in this congregation. The names of those who made the chapel a reality are recorded in the Book of Remembrances. The Book of Remembrances has become an important part in the ongoing life of the congregation. The names of those honoured within this sanctuary will be entered here, and thus remembered as we continue to serve Christ. The Communion Table in the Somers Memorial Chapel is the one used for the Sacrament in the sanctuary before the renovations of 1931. On the table sits a Celtic Cross, sacred to the memory of Dr. Somers. It was the gift of his wife. The chairs are in memory of Louis Sadler and Frank Shannon Sadler. The lecterns, benches and railings were memorials gifts of others. To the left of the Chancel and in balance with the Somers Chapel is the Prowse Memorial. This is an entrance alcove and quiet retreat created in 1969 by the Honourable T.W.L. Prowse and family in memory of Mrs. Prowse. The chair in the Prowse Memorial was in memory of Howard L. MacDonald - 1980. On the North wall is a doorway leading into the Hyndman Memorial Archives. This room was originally the minister's vestry. In 1977, it was refurbished in memory of members of the Hyndman family. It houses historical material relating to the Kirk and its people. In the Prowse Memorial is an oak case which was presented to the Women's Missionary Society of the Presbyterian Church in Canada. It houses historical records. In the Hyndman Memorial Archives is a similar case which houses the Communion Set in silver plate. The Communion Service and the two cases were gifts of Mr. and Mrs. W.A. Stewart, and were given in memory of Daniel Stewart, a former elder. The first case was built by the Chandler Brothers in 1948. The second case was built in 1923 by Duncan Livingstone, a Church Officer. To the left as you enter the Pownal Street door is a plaque in memory of Edith Lillian MacKenzie, Mus. Bac., F.M.C.M., Organist and Director of Choirs for many years. Next are the Roll of Honour and the For King and Country Roll listing the names of those who went to war. To the right is a plaque from the Prince Edward Island Museum and Heritage Foundation dated June, 1988 and a numbered print of the Kirk of Saint James. on the East wall of the Fitzroy entrance is a plaque dated 1965, with respect to the renovations to the Church Hall and Sunday School rooms. 1853 Mr. Lydiava to form and conduct a choir. 1855 Proposal to secure a Precentor to conduct the Psalmody. 1857 Mr. Norman Lowden employed as choir director Mr. John B. Strong led the choir for three months. An organ was ordered and purchased. 1869 Choir asks to move down from the gallery - too cold. 1870 Mr. Lang conducted a choir concert. Mr. Smythe acted as choir master. 1873 Mr. Stamberg is in charge of the Psalmody. 1881 Miss McFarlane to take charge of the instrument. 1888 Mr. Earle to take the choir. 1892 Purchased a pipe organ - not to exceed $3,000.00. 1893 Had to purchase a water motor for the pipe organ. 1894 Mr. J.E. Bell was the choir instructor - already the organist. 1904 - Mr. W. MacKie appointed organist. 1905 - Miss Alice Hansin was organist and choir instructor. 1908 - Professor Singleton was organist and choir master. 1909 - Mr. Colvill engaged as Organist for three months. Professor Watts was choir master - paid by the night. 1919 - Professor Barlow was thanked for his efforts with the choir over the years. years. Mr. George Mathuen was organist and leader of praise. 1930 - Mrs. Keith Rogers was appointed organist. 1932 - Mrs. Lawson and Mrs. R. Reymond were choir directors. 1941 - Miss E. Lillian MacKenzie was organist and directress of the choristers. Mrs. Roberta Full served during the illness of Miss MacKenzie. 1961 - Mr. Christopher Gledhill appointed organist and choir director. choir directors - Mr. Gledhill was on a two year leave of absence. 1978 - Mr. Gwillym Bevan appointed organist and choir director. 1983 - Mr. Case Van Hemert appointed Director of Music. The role played by the women of the Kirk since 1825 has been for the most part low keyed but tremendous in its impact. No undertaking, however great or small, lacked their sympathy and support. If today the Kirk merits recognition in its own circle, community or Province, much credit must go to the women's organizations that flourished through the years. The Ladies Aid, The Guild and Women's Missionary Society, in early years, were outstanding in their contributions of service. The Ladies Aid and The Guild joined to form The Kirk Auxiliary in 1958. In 1972, they along with the Women's Missionary Society formed The Presbyterian Women of the Kirk of Saint James. The Auxiliary operated in six groups - East, West, Central, Brighton, J.O.Y. and Dorcas, but held a general monthly meeting to coordinate activities. This continues under the Presbyterian Women of the Kirk. Over these many years, very large sums of money have been raised by the women of the Kirk and given to the Trustees to assist with the many financial trials which they encountered. As groups and as individuals they have always been "at the ready" to assist wherever possible. The congregation of the Kirk of Saint James "thanks" the women's groups for all their assistance. In 1966, women became eligible to become elders and ministers with the Presbyterian Church in Canada. As such they have taken on their new roles with that same dedication and determination and continue to add to the place of our Church within our own congregation, Province, Country and abroad. The first woman to be elected to the eldership at the Kirk was Pauline Prowse. Mr. Mackintosh was sent out by the Glasgow Colonial Committee of the Church of Scotland. Mr. McIntyre came from Scotland. Due to the vacancy of four years the records show that the Church of Scotland urged him to “proceed with as little delay as possible via one of the steam packets. 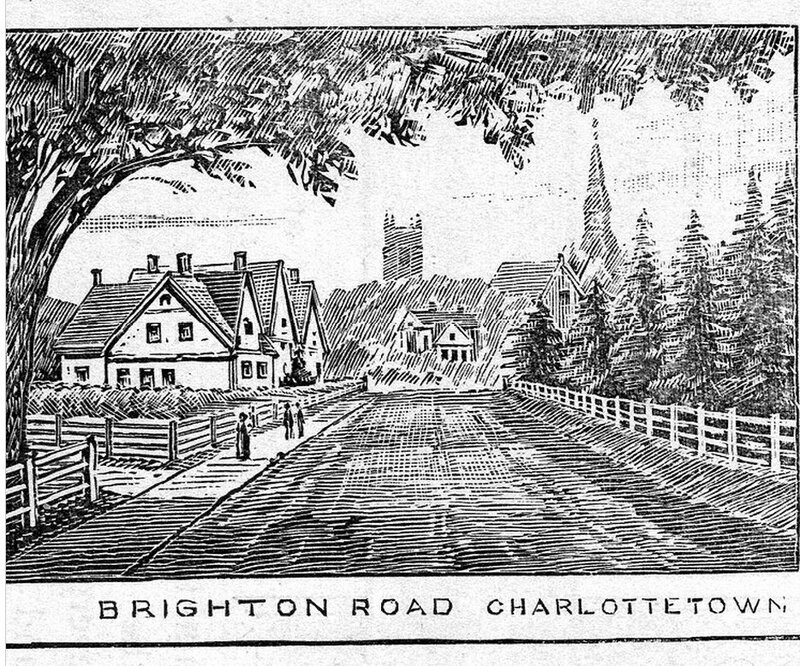 He was assured that he would receive a kind and cordial welcome from the Presbyterians in Charlottetown.” The young minister proved to be an eloquent preacher and a faithful worker. He often visited and preached in destitute stations and congregations throughout the Province. Mr. Brown was a young Irish minister. Although he was only able to stay for six months, his work was appreciated. 1849 Reverend John McBean, M.A. Due to ill health Mr. McBean served only six months. Mr. McNair was popular as a preacher and as pastor. He embraced heterodox views regarding the Sabbath. Dr. Snodgrass was a missionary to the congregation. 1855- 1856 Reverend William Snodgrass, M.A., D.D. 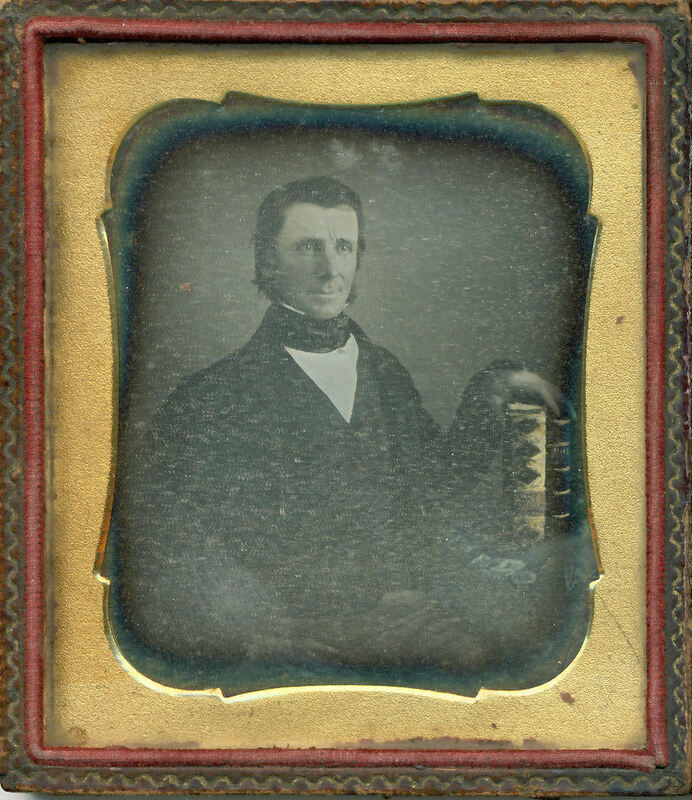 Dr. Snodgrass was the minister of the Kirk. The congregation developed into one of the most active and flourishing in the Presbytery. In later years he became Professor of Divinity and Principal of Queen’s University in Kingston, Ontario. He was the valued convenor of the Synod’s Committee on the union of all Presbyterian Churches in Canada. He was one of the four Moderators to sign the solemn Deed on Union, at Montreal, Quebec, on June 15, 1875. 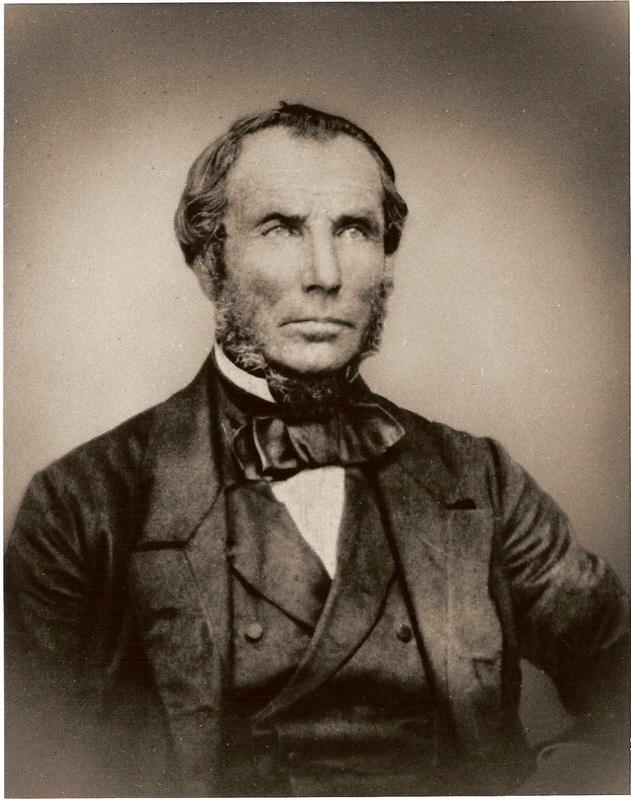 Under Mr. Duncan's leadership the congregation grew to the point of the need for a new church. Not only was he the driving force in the expansion of the Kirk but he also was interested in the Evangelical Alliance, the Y.M.C.A. and other worthwhile organizations. He was married to one of the Hyndman family of Charlottetown and their son, George, who was born in the Kirk manse, later became a minister. 1877- 1884 Reverend Kenneth MacLennan, M.A. Mr. MacLennan influenced the congregation to build a new church. His gifts and skills as an authority on ecclesiastical architecture are reflected in the beauty of the second Kirk. Mr. Carruthers came from Pictou, Nova Scotia. The congregation was burdened with a heavy debt and there was division and disorganization. Mr. Carruthers succeeded in overcoming these difficulties over his seven years in the church. 1893- 1921 Reverend Thomas F. Fullerton, M.A., D. D.
Dr. Fullerton soon earned a unique place in the life of the congregation, the community and the Province. He enlisted as Chaplain and gave distinguished service with the Canadian troops in the South African War. His memory is cherished and his ministry is commemorated in the memorial stained glass window given by his family. 1921 - 1925 Reverend William Orr Mulligan, D.D. Dr. Mulligan came from Bedford, Nova Scotia. He served through the troubled years of the Union controversy. Later Dr. Mulligan won distinction in the field of Church Law. The Kirk Session records that Mr. Muir gave strenuous and faithful service to Saint James and also to the church at large. He expounded and preached the Word of God with zeal and power. He devoted his many gifts to the extension of Christ's Kingdom and to the welfare of the community. 1930 - 1941 Reverend Robert MoorheadLegate, D.D. Dr. Legate came from Burlington, Ontario. He had served in Australia and the Fiji Islands. Dr. Legate was a pastor in the truest sense of the word. He is remembered for his diligence in visiting the members of the congregation. 1941 - 1965 Reverend Thomas Henry Bussell Somers, M.A., S.T.M., D.D. Dr. Somers was the first Canadian born minister of the Kirk. He was a native of Toronto, and ordained in Vancouver. He served as the minister of the Kirk until his death on June 24, 1965. His love of people and intellectual genius and diligence both endeared him to the congregation and earned a respect that continues to the present day. 1965 - 1972 Reverend Malcolm Adams McCuaig, B.A., B.D., D. Min. Dr. McCuaig was born in Montreal and graduated from Sir George Williams University and the Presbyterian College. He gave faithful and distinguished service to the affairs of both the congregation and the community. 1969 - 1970 Reverend A.G. Faraday, C.D., M.A. Mr. Faraday was an Interim Minister during a study leave granted to Dr. McCuaig. 1972 Reverend John Robert Cameron, B.A., B.D., D.D. Dr. Cameron is a native of New Glasgow, Nova Scotia. He graduated from Acadian University in Nova Scotia and from Presbyterian College in Montreal. He came from Lunenburg, Nova Scotia to the Kirk. In 1970-71, while in Lunenburg, he was elected as Moderator of the Maritime Synod. In 1981 he was awarded an honorary doctorate from Presbyterian College in Montreal. In 1983, Dr. Cameron was invited to write a booklet on the pastoral responsibility of the elder. The Presbyterian Church in Canada has had three re-printings completed. In June 1991, Dr. Cameron brought great honour to himself, to the Kirk of St. James and to the Province of Prince Edward Island when he was elected as the Moderator of the Presbyterian Church in Canada. Dr. Cameron is the first Moderator of the Presbyterian Church in Canada to come from Prince Edward Island. 1985 - Reverend Susan Lawson, B.A., Dip. Soc. Sci. Ms. Lawson graduated from the University of Wales, the University of Birmingham, England and Knox College. She was ordained in 1978 by the Presbytery of Assiniboia. Her two year mission appointment was to the Brookfield Pastoral Charge on Prince Edward Island. In 1980 she was called to the same Pastoral Charge. In 1983 she became the Chaplain at the University of Prince Edward Island, Holland College and Hillsborough Hospital. In 1985, Ms. Lawson was appointed as a half time Assistant Minister at the Kirk. In 1989, she was inducted as the Associate Minister of the Kirk of Saint James.